Susan Today: 5 Months Old!! Kyle has done so much over the last month that I don't even know where to begin! We have ventured into many new realms - the swimming pool, the tub, jumperoo, more plane rides, long car trips, rice cereal, and his first Red Sox game - to name a few. Aunt Tracey and cousin Liv came to GA early in June and spent a few days with us. During their visit we discovered that the pool is a cool place to be. He prefers the a warm water, evening swim. We tried an early morning swim with not as much success. Kyle also decided that whatever Olivia was doing with that food looked pretty interesting. So we tried rice cereal more seriously. Imagine a baby bird going after the worm. It was priceless. 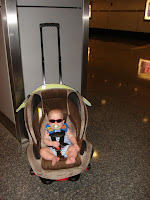 After a few days of sun and fun, Kyle and Mommy made the long 11 hour trek back to WV with Aunt Tracey and Liv. Kyle was a champ on the road, and only was fussy around hour 5... but who isn't? 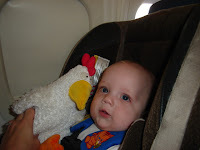 We spent the week in WV visiting with MaMa and Grandpa Szabo where he got to see cousin Kelaen's baseball game, go to the Greek fest and find his soulmate - the chicken from Barnyard Dance by Sandra Boynton. I have a feeling we will see a lot of chicken in photos over the years. Kyle was very happy to see Daddy at the airport after his 2 week training. So happy, that he sprung for a limo ride home :). 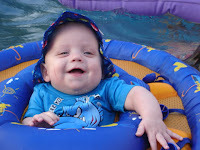 Kyle enjoyed the pool so much, I thought I would again attempt the tub with meand met with MUCH more success! Not a whimper! Of course, the rubby ducky might have helped. Kyle's buddy, Ms. Vi added to his tub toys with a plastic book, which he adores. Sorry, no photos because I would have to be in the too. We have just returned from our annual 4th of July jaunt to New England where Kyle spent time with Nana and Grandpa Bergman and meet all his cousins, aunts and uncles. The highlight of the weekend though, had to be his meeting with Wally, the Red Sox mascot. He came to visit us at our seats during the July 7th game with Minnesota. We were a little concerned that Grouchy Face might make an appearance since A. Kyle was tired and B. Wally was WAY bigger than the ones on his mobile! Luckily, it went pretty well. He was hamming it up for the crowd. Somehow I think he has Daddy's personality.